Social science research has frequently found conflict between Latinos and African Americans in urban politics and governance, as well as in the groups' attitudes toward one another. 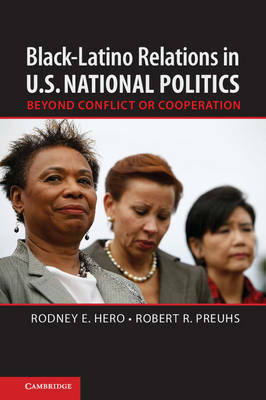 Rodney E. Hero and Robert R. Preuhs analyze whether conflict between these two groups is also found in national politics. Based on extensive evidence on the activities of minority advocacy groups in national politics and the behavior of minority members of Congress, the authors find the relationship between the groups is characterized mainly by non-conflict and a considerable degree of independence. The question of why there appears to be little minority intergroup conflict at the national level of government is also addressed. This is the first systematic study of Black-Latino intergroup relations at the national level of United States politics.